Ten specializations. 100% online. No GMAT. To learn more about Lynn University's MBA Online and download a free brochure, fill out the fields below. You can also call 877-388-7239 to speak to one of our Admission Counselors about the degree program. Lynn University respects your right to privacy. By submitting this form, you consent to receive emails and calls from a representative of Lynn University, which may include the use of automated technology. Consent is needed to contact you, but is not a requirement to register or enroll. Lynn's award-winning, tablet-based academic initiative puts a powerful mobile research and learning tool into the hands of our students. As a part of the initiative, all Lynn MBA students, whether on campus or online, receive an iPad® upon admission. 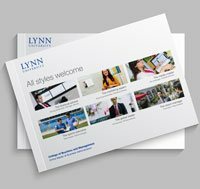 At Lynn University, our goal is to provide you with the affordable, quality distance education you need to pursue your individual passion in business – whether that’s running your own start-up, mastering the in’s and out’s of investment banking or joining the ranks of a Fortune 100 company. With this philosophy in mind, we’ve designed our online MBA to be highly flexible. You'll begin with the core courses that form the foundation of any solid graduate business program. From there, you can customize your studies through three open elective courses and nine specializations. You’ll have the opportunity to refine your knowledge, learn valuable skills tailored to your desired field and distinguish yourself from your peers. Each specialization is taught by expert faculty who are dedicated to student development and providing a distance education that helps students to maximize their academic and professional potential. To learn more about each specialization and the Lynn University online MBA, use the form provided and download a free brochure. Nationally ranked by U.S. News and World Report and voted 'Best in the Region' by the South Florida Business Journal, the Lynn University online Master of Business Administration program is a fantastic way to earn your MBA while enjoying the convenience of online learning. Students of the Lynn University MBA online enjoy coursework designed by our expert faculty, unparalleled convenience, and small class sizes, which offers frequent opportunities for close interaction with peers and rich discussion of the coursework. The program's ten distinct, focused specializations make for a highly-customizable program that students can tailor to their career goals. The Lynn MBA online can be completed in as little as 1 year, which means you won't have to wait long to reap the benefits of this IACBE accredited program. With no GMAT score required for admission, Lynn University's MBA online can help make it easier to start the path towards a better career. We invite you to browse through our varied offerings to pick the program that suits your needs. If you'd like to learn more about the Lynn University online MBA and its specializations, use the form provided to request more information. 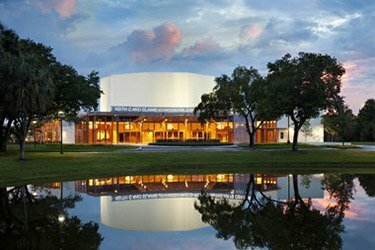 Lynn University's vision is to be recognized as one of the most innovative, international, and individualized small universities in America. Lynn University will capitalize on its youth, location, and close student and faculty bonds to become a forerunner institution, a different kind of learning center, an independent, innovative 21st century university that is devoted to preparing young persons for America's and the world's future. Remain relatively small, with approximately 2,400 undergraduate and 600 graduate students, and 500 or more adults enrolled annually in continuing education courses and institutes. Maintain a multi‐faceted, coeducational, primarily residential university with a small‐college atmosphere. Admit a wide array of diverse students, from those with learning differences to the gifted, and those from many countries of the world and states across the nation. Be grounded in the liberal arts but contain a collection of colleges oriented toward emerging professional opportunities, each of which feature superior teaching, applied learning, international focus and experiences. Contain a hallmark student development program that discerns each student's strengths, shortcomings, and special needs and works to develop his or her full capabilities. Lynn University is committed to evolving as an institution, providing the best possible educational experience for its students using cutting-edge technologies while maintaining an affordable opportunity for graduate-level business study. In pursuit of that goal, we're proud to offer our online MBA students an iPad upon admission. Employing this technology enables Lynn to connect our students with a powerful learning tool, one they can use to complement their education and access a number of pre-loaded applications. Students can use the device to supplement their coursework with interactive apps, a growing selection of faculty-produced iBooks, and access to the iPad's many functions and tools while on-the-go. Take the iPad with you after graduation and use it for applications in the workplace related to investment banking, project management, athletic administration and more. 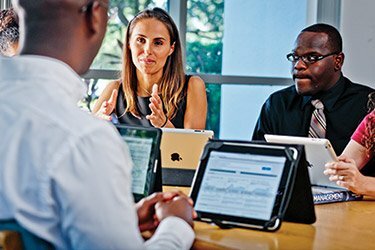 If you'd like to learn more about the Lynn University online MBA and the iPad Initiative, fill out the form provided to request more information and download a free brochure. Learn the ins-and-outs of airport operations and aviation organizations and management. Your training will prepare you to take on middle- and upper-level management positions at airports, airlines, fixed-base operators, government agencies and consulting firms. Hone your skills in measuring and managing value, increase your efficiency as a portfolio manager, gain a deeper understanding of financial analysis and learn development strategies for increased output and improved outcomes. Graduates of this specialization can obtain senior financial analytical positions within all sectors of the global economy. Understand the world around you and become a better businessperson for it. Discover the trends and areas of growth in international trade and investment; build a strong foundation in international finance and engage in an in-depth exploration of special topics in international business affecting the workforce today. Graduates of this specialization Could gain management and senior analyst positions in HR, finance, natural science/energy, IT, healthcare and project management. Become the healthcare leader who inspires staff and raises quality for patients. You'll explore the complexity of the healthcare industry and how managerial and operational strategies connect with patient care. Graduates of this specialization pursue opportunities as clinic directors, healthcare management consultants and administration roles in other care settings. Take hold of the hospitality world as a leader with managerial and interpersonal savvy. Understand how to efficiently lead resort operations, improve services and offerings, and manage food service administration. Graduates of this specialization go on to work in event planning, food service and lodging management across the globe. Be the marketing manager you would want to work for. Students acquire a practical understanding of business functions, leadership techniques, strategic implementation, and the challenges of keeping pace with a dynamic, global economy. Graduates of this specialization go on to pursue managerial positions in communications, sales, marketing, advertising, corporate communications, consulting and public relations. Become a communicator, strategist and media connoisseur at the highest level. Take on the newest technologies and communication planning trends while honing the necessary skills to confidently manage legal issues and regulation in mass communications and the global media world. Understand how media and culture are intertwined and how to make your message count. Graduates of this specialization go on to pursue managerial positions in communications, public relations sales, marketing, advertising, corporate communications, consulting and public relations. Manage at an intercollegiate and professional level with improved skills in athletic administration. Learn to create an optimal environment for interpersonal and business growth while understanding the issues that affect the future of the industry. Graduates of this specialization go on to pursue managerial positions in professional sports teams, sports and fitness marketing, private and public health clubs and sports stadiums and arenas. Learn to recognize and lead new entrepreneurial ventures that bring bold ideas to market. This specialization focuses on both the creative and practical elements of entrepreneurship, examining innovation and original thinking alongside finance, forecasting and managing working capital. Courses also study the funding sources available to entrepreneurs and how to pitch a new concept to investors. Gain the skills expected of today’s HR leaders in this focused course of study. Complete an overview of the management techniques that guide human resource managers while specifically examining essential areas of the field like labor law, benefits, compliance and compensation. Whether you are a computer programmer who wants to learn relevant business skills or a software-savvy business professional who wants to learn more about programming, specializing in Web Development Management expands your career options. It is ideal for students who want to work for a company in the technology sector or launch their own high-tech startup. This specialization, offered in collaboration with Wyncode Academy, is a hybrid program blending Lynn’s online MBA courses with on-site courses at the coding bootcamp’s locations in South Florida. The Social Innovation Management specialization equips students with the knowledge, insights and skills to drive positive social change. This specialization is ideal for individuals who are passionate about improving the world and plan to create their own startup or work with a nonprofit organization or social enterprise. It is a hybrid program blending Lynn’s online MBA courses with those offered in collaboration with the Amani Institute, a non-profit based in Nairobi, Kenya, and São Paulo, Brazil.